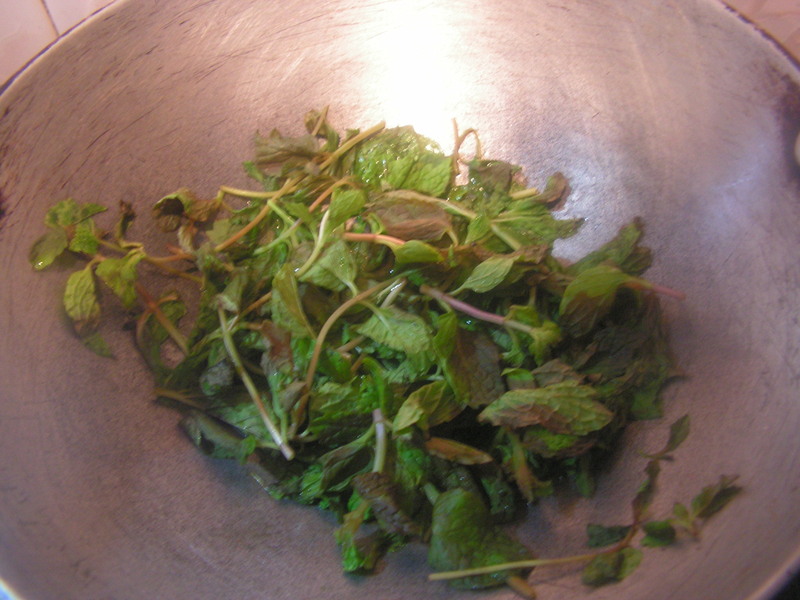 Mint/pudina is a very popular green though not as popular as cilantro. It has medicinal as well as cosmetic properties. It is used during indigestion and also used as a mouth freshner. Somehow though growing up in Bangalore it was not at all popular at home. I mostly saw this in restaurants in coconut chutney and Chanadal Vada. On this blog I have put up Pudina Chutney, Mint pulav and pudina flavoured fried cauliflower pakoras. This one today is Pudina rasam, very simple and tasty. 1. 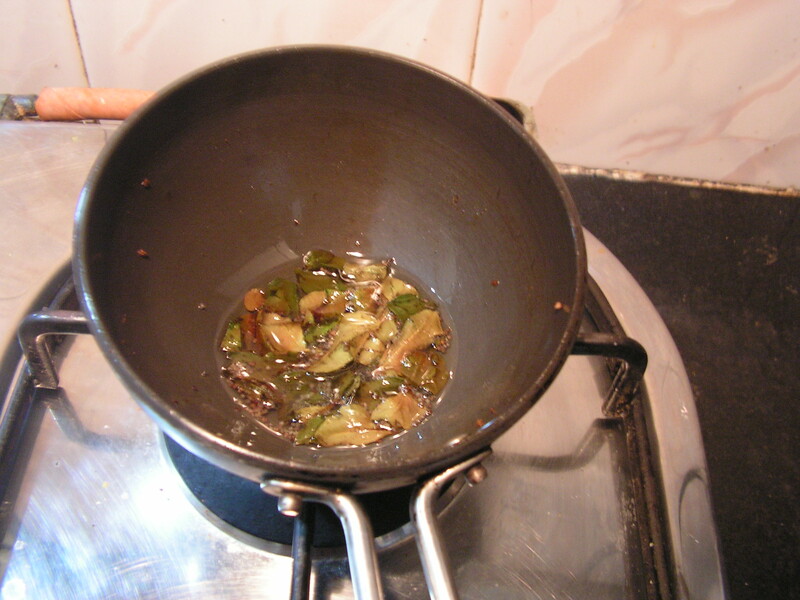 Separate the leaves from the stem and fry it in a little ghee in a skillet till it is done. 2. 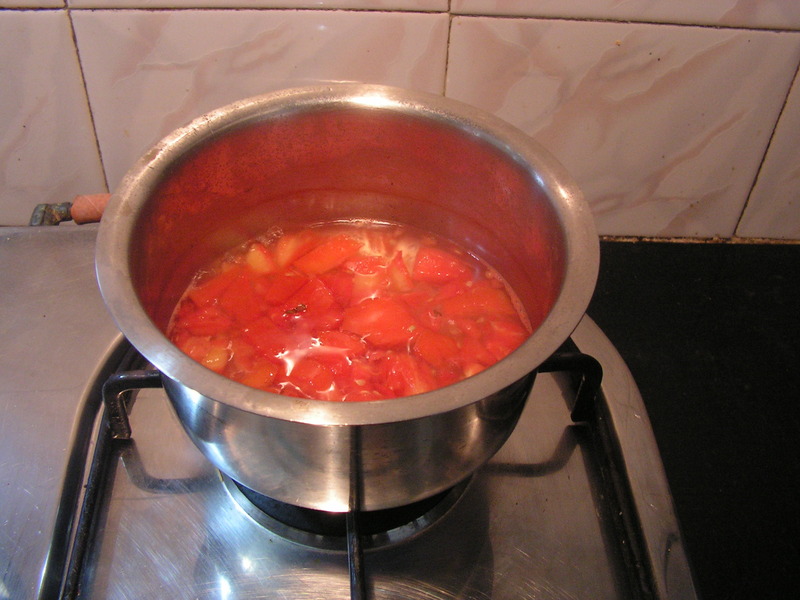 Chop tomato and cook it in broad bowl adding 1 cup of water till done. 3. 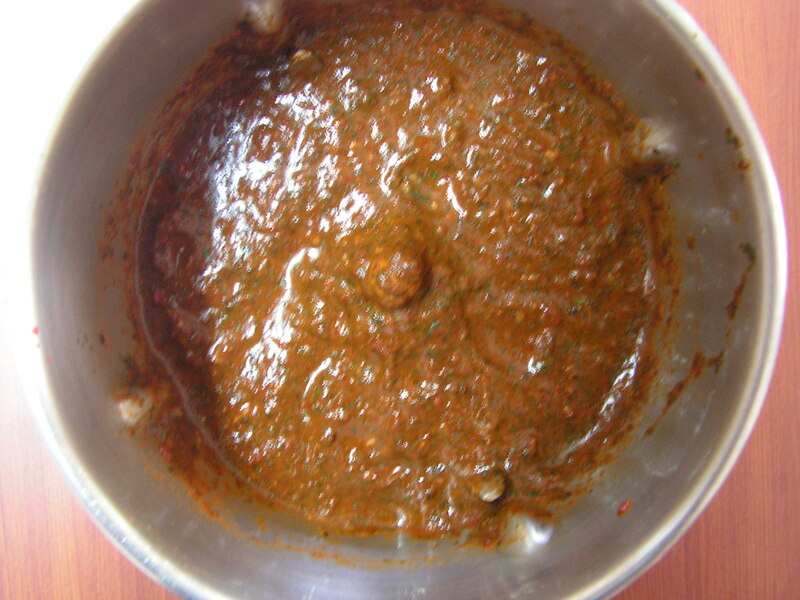 When done, grind fried pudina leaves and red chili in the mixer adding sufficient quantity of water to a fine consistency. 4. Extract coconut milk by grinding coconut in the mixer adding required quantity of water and straining it later. 5. On tomato being cooked add the grind mixture from step 3 to it and bring it to boil on medium flame. 6. Once it is boiled add coconut milk to it and bring it to boil on sim so that it does not curdle. Keep it down and add salt to it. 7. Place a spatula with 1 teaspoon cooking oil in it on low flame. On heating add mustard seeds to it. When it splutters add asafoetida powder, curry leaves and switch of the flame. Season it to the dish. 8. Season it to the dish and serve hot with rice and papad. 1. Pudina leaves should be properly fried in ghee to get rid of the raw odour. 2. After adding coconut milk it is always better to boil on low flame and add salt later to avoid it from curdling of the dish. 3. This rasam is a good remedy for stomach upset and cold too. It can be even sipped as soup too. This entry was posted in Uncategorized and tagged Lunch side dish, soup. This poli saru is nothing but the rasam/saru prepared with the stock of the cooked Bengalgram dal while preparing “Puran poli. Cooked dal is poured in a collander and stock collected there in will be seasoned by adding other necessary ingredients. It is prepared as per one’s pallot. In some house hold they prepare it like the simple rasam and in others they prepare it by adding some ground masala with garlic seasoning. Here is my version of Poli saru. 1. Cook Bengalgram dal as usual in cooker and transfer it into a collander to collect the dal stock. 2. 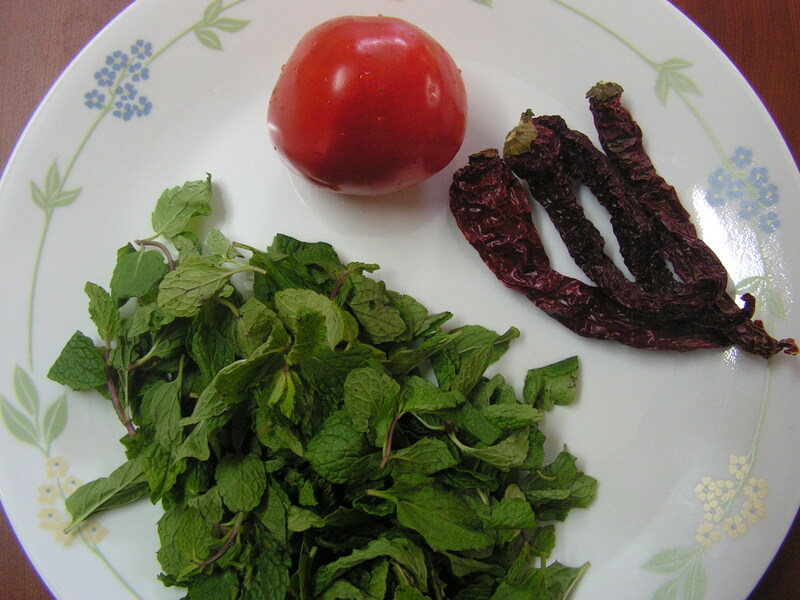 Wash and chop tomato, slit green chilly and chop coriander leaves fine and keep it aside. 4. Place aspatula with 2-3 teaspoons of cooking oil in it on low flame. When heated, add mustard seeds to it. Once it splutters add red chilli pieces, Asafoetida powder and curry leaves in a row and switch off the flame. Season it to the dish from step 3 to it. Add chopped coriander leaves and close it with a lid. 1. We prepare this saru only when we prepare “Puran poli”. 2. Since dal stock is normally thick one can add required quantity of water to bring it to the required consistency. 3. 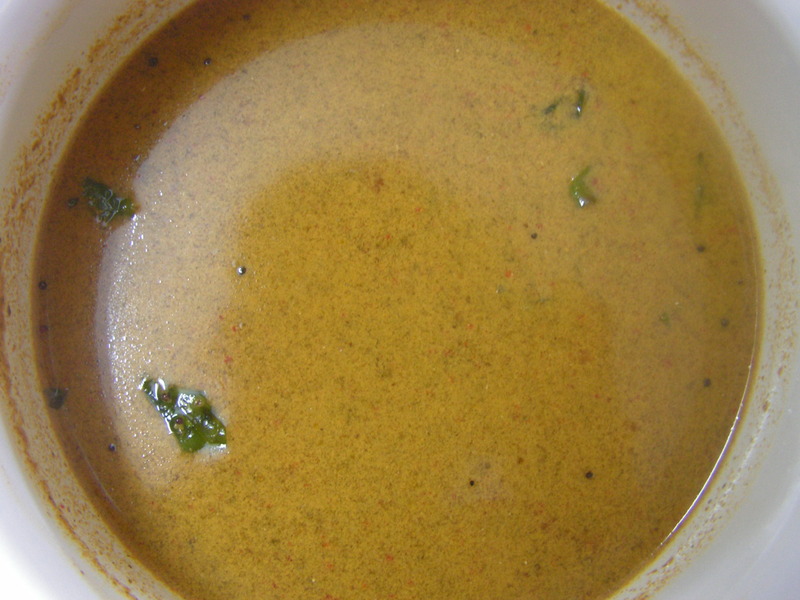 Serve stiring every time since the stock remains at the bottom and the rasam looks like plain water. This entry was posted in Uncategorized and tagged Gravy, Rasam, soup. Buttermilk, thats Majjige in Kannada and Thaka in Konkani. We prepare a number of dishes with curds and buttermilk. What I am putting up here is a delicacy of Kannadigas of Bangalore and naturally this one is borrowed from one of my friends from Bangalore. Ashguard is the main vegetable used for this dish though occasionally carrots are also used. This one is a good recipe to have in your repertoire for the summers. 1. Wash and chop Ashguard, carrots into 2″ long pieces and cook in the cooker adding a little salt so that it is not overcooked. 2. Soak Bengalgram Dal in water for about 30 minutes till it is soft – you may pierce with your nails and see if it is done. 3. Drain water from soaked Bengalgram Dal and grind it with grated coconut, green chillies, cumin seeds and turmeric powder to a smooth consistency in the mixer adding water in steps. 4. Transfer cooked vegetables from step 1 to a bowl and add the ground masala to it. 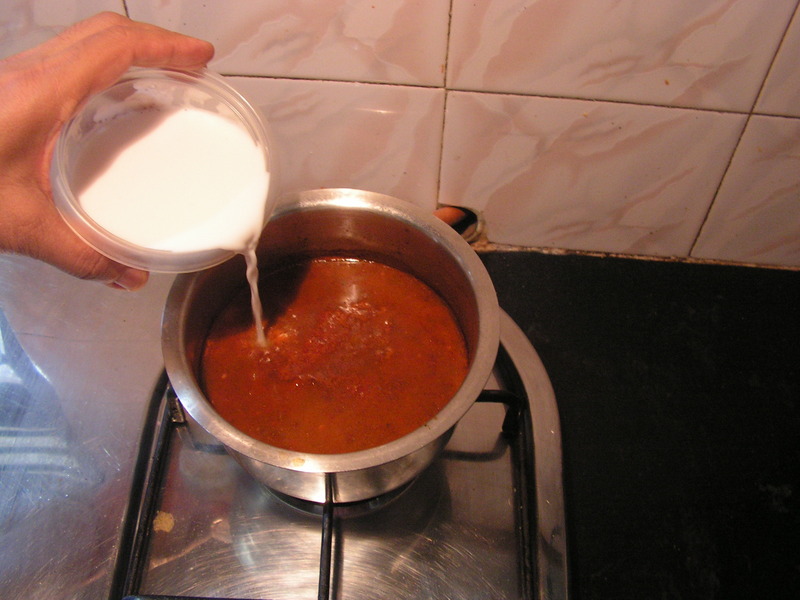 Add sufficient quantity of salt and heat the mixture on a medium flame until it comes to a boil. 5. Once its boiling, turn down the flame, add curds and bring it to boil again. 6. For seasoning: Place a skillet with 3-4 Teaspoons of cooking oil in it. When heated add mustard seeds to it. As it sputters add red chilli pieces, Asafoetida powder and curry leaves and switch off the flame. Add the seasoning to the dish and your ready to serve Majjige Huli looks like this the image down here. Enjoy as a side dish for Lunch/Dinner. This entry was posted in Uncategorized and tagged 45 minutes, soup. 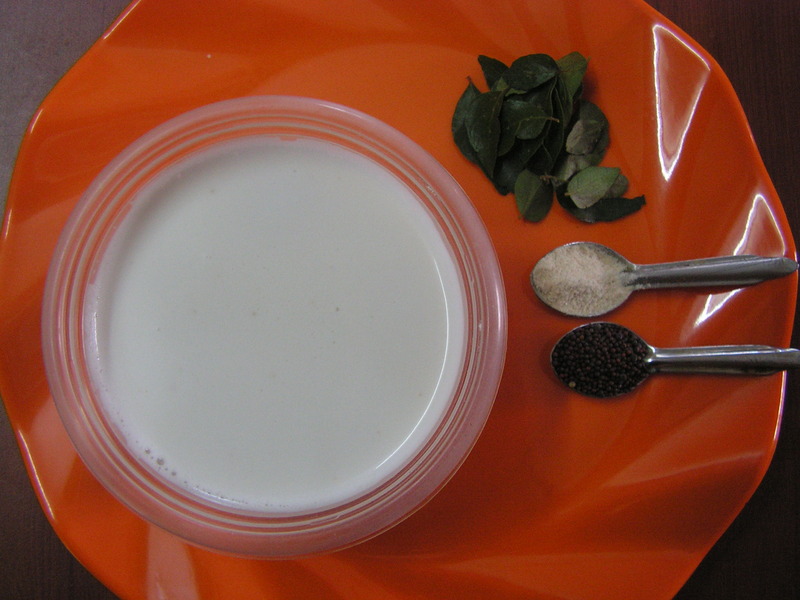 Jeere in Konkani is cumin ( same as Jeera in Hindi ) & Meere means Pepper. The two combined results in a marvellous soup – either functioning as an apetiser or as gravy with rice. People who have recovered from fever etc., who will have a bad pallete will find that this dish will really help them regenerate their lost sense of taste. It good for digestion too. A very simple recipe but very tasty and loved by one and all in my family. Why don’t you give a try!!!! 1. Grate coconut and keep it aside. 2. Place a thick bottomed bowl on the flame with 2 teaspoons of oil in it. On heating add cumin seeds to it. When it sputters add pepper corns to it. Add also red chilli and later on add the grated coconut from step 1 to it. 3. Let the above mixture roast on a medium flame till all the moisture evaporates from it and turns almost dry as shown in the image below. 3.Grind the above roasted ingredients adding required quantity of tamarind and water in the grinder to a fine consistency . 4. Transfer the ground mix to a bowl and place it on the flame and bring it to boil adding required quantity of salt and 1/2 litre water in all. 5. Place a spatula with 3-4 teaspoons of cooking oil in it. Add pealed garlic cloves to it and fry it till it turns brown and crispy. Season it to the kadi from step 4. One may even season it with Mustard seeds and curry leaves. Ready to serve Kadi is as shown in the image below. 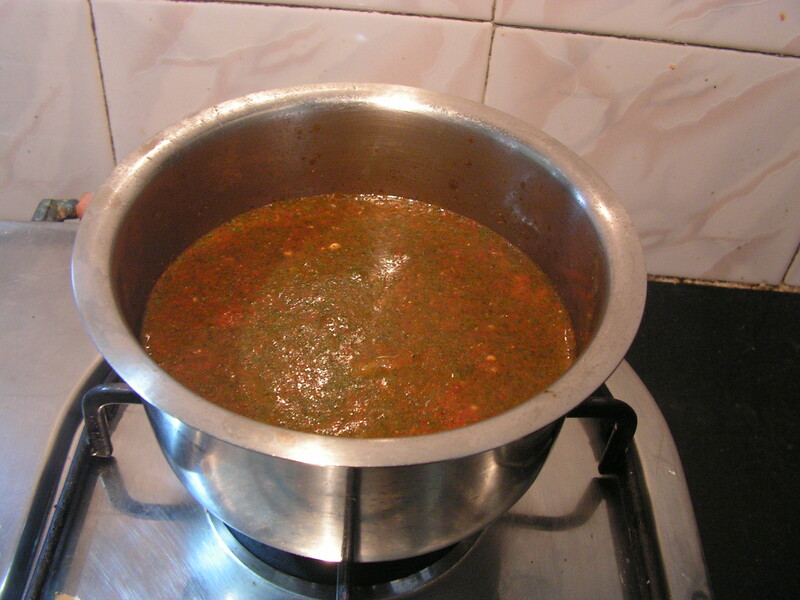 This entry was posted in Uncategorized and tagged Gravy, Konkani dishes, soup.